July is “Man vs. Wild” month at The Dissolve, and there was no question that we’d be kicking it off with a Werner Herzog film—it was more a question of which Werner Herzog film. 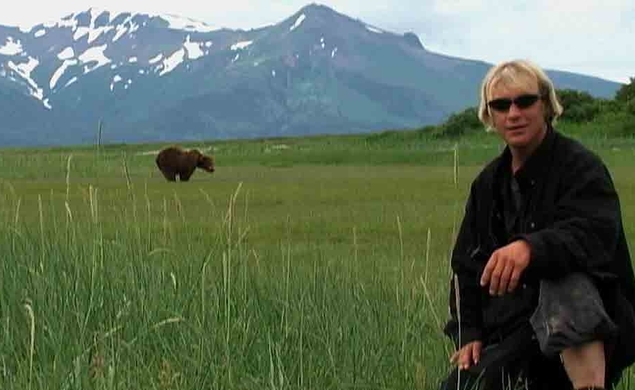 We settled on Grizzly Man, his astonishing 2005 documentary about Timothy Treadwell, an environmental activist and filmmaker who lived among the bears for 13 summers in Alaska’s Katmai National Park before one of those bears mauled him and his girlfriend, Amie Huguenard, on October 3, 2003. Treadwell left over 100 hours of footage behind, which Herzog fashions into a fascinating portrait of a man whose bond with these animals spoke not merely of his fatal naivety, but also of a desire to transcend his troubled life and free himself from the disappointments and hostility of the civilized world. Released the same year that March Of The Penguins became a documentary phenomenon, Grizzly Man soundly rebuffs that film’s anthropomorphic view of nature, which is part of what got Treadwell into trouble. Herzog’s famously caustic perspective on the wild—in Burden Of Dreams, a doc about the calamitous making of Fitzcarraldo, he likened the sounds of the jungle to “the harmony of overwhelming and collective murder”—opens up a lively dialogue between Herzog’s narration and Treadwell’s footage, but not an entirely contentious one. In my Keynote on Tuesday, I’ll talk about the complex relationship between Herzog and Treadwell in Grizzly Man and how it’s more about the human struggle than the cruel realities of nature. On Thursday, Tasha Robinson will consider Herzog’s obsession with the “Man vs. Wild” theme and, in the forum, Keith Phipps and Genevieve Koski will explore the film in more detail. We welcome kind warriors in the comments section.